Bluetooth Low Energy (Bluetooth LE, BLE), also known as Bluetooth Smart is a wireless personal area network technology aimed at applications in the healthcare, fitness, beacons, security, and home entertainment industries. Compared to Classic Bluetooth, Bluetooth LE is intended to provide considerably reduced power consumption and cost while maintaining a similar communication range. This article describes how to use Bluetooth Framework with Bluetooth LE GATT Profiles. To learn how to use Bluetooth Framework with Bluetooth LE Beacons refer to the Bluetooth Framework and Bluetooth LE Beacons article. If you run Windows 10 1609 and above and your Bluetooth LE device is paired you may face issue with receiving OnDisconnect event. Unapir device before connect. If you run Windows 10 1703 and above and your Bluetooth LE device is paired you may face issue with reading device services, characteristics and other properties. Unpair device before connect. if you run Windows 10 1803 and above and your Bluetooth LE devuce is paired you may get randomly device disconnection. Unpair device before connect. The Generic Attributes (GATT) define a hierarchical data structure that is exposed to connected Bluetooth Low Energy (LE) devices. The GATT profiles describe a use case, roles and general behaviors based on the GATT functionality. Services are collections of characteristics and relationships to other services that encapsulate the behavior of part of a device. 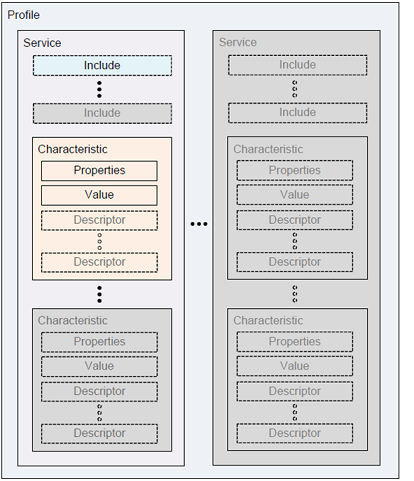 This also includes hierarchy of services, characteristics and attributes used in the attribute server. On top of the GATT hierarchy is a profile, which is composed of one or more services necessary to fulfill a use case. A service is composed of characteristics or references to other services. A characteristic consists of a type (represented by a UUID), a value, a set of properties indicating the operations the characteristic supports and a set of permissions relating to security. It may also include one or more descriptors—metadata or configuration flags relating to the owning characteristic. GATT defines client (BLE Central) and server (BLE Peripheral) roles. The GATT server stores the data transported over the air to the GATT client and accepts requests, commands and confirmations from the GATT client. The GATT server sends responses to requests and sends indications and notifications asynchronously to the GATT client when specified events occur on the GATT server. GATT also specifies the format of data contained on the GATT server. Current version of the Bluetooth Framework supports only GATT Client (Central) role with BlueSoleil and Microsoft Bluetooth drivers. BlueSoleil Bluetooth drivers allows to use Bluetooth LE GATT features on any Windows platform starting from Windows XP. Microsoft Bluetooth drivers supports BLE GATT features starting from Windows 8. The first type is a short 16-bit UUID. The predefined Heart rate service, e.g., has the UUID 0x180D and one of its enclosed characteristics, the Heart Rate Measurement characteristic, has the UUID 0x2A37. The 16-bit UUID is energy and memory efficient, but since it only provides a relatively limited number of unique IDs there is a rule; a device can only transmit the predefined Bluetooth SIG UUIDs directly over the air. Hence there is a need for a second type of UUID so vendors can transmit their own custom UUIDs as well. The second type is a long 128-bit UUID, sometimes referred to as a vendor specific UUID. This is the type of UUID vendors need to use when they are making their own custom services and characteristics. Bluetooth Framework supports both types of the UUIDs through wclGattUuid structure. To communicate with a Bluetooth LE device your application must know the Bluetooth Device Address, the 48-bit (6-byte) number that uniquely identifies a device among peers. There are two types of device addresses: Public and Random Device Address. Public Device Address is the standard, IEEE-assigned 48-bit universal LAN MAC address which must be obtained from the IEEE Registration Authority. It is divided into two fields: IEEE-assigned company ID held in the 24 most-significant bits; Company-assigned device ID held in the 24 least significant bits. Static Random Device Address is a 48-bit randomly generated address. A new value is generated after each power cycle. If the static address of a device is changed, then the address stored in peer devices will not be valid and the ability to reconnect using the old address will be lost. Private Random Device Address is used when a device wants to remain private. These are addresses that can be periodically changed so that the device can not be tracked. These may be resolvable or not. Resolvable Private Addresse is an address that can be resolved through a pre-shared hash key: Only the trusted entities that have your pre-shared key can identify you. For all other entities, the address seems to be randomly changing and untrackable. These addresses are generated by a mathematical algorithm using the Identity Resolving Key (IRK) - this is one of the keys exchanged during pairing. Non-Resolvable Private Addresse is an address that is random and can not be "expected". A possible use case: a device that already communicated a non-resolvable address to a peer for a reconnection. Bluetooth Framework supports any type of the Bluetooth LE Device Addresses. However there is no easy way to resolve the Resolvable Private Addresse to real Device MAC at the moment. To be able to communicate with a Bluetooth LE device an application must get currently available Bluetooth Radio object. The Bluetooth Radio object represents a Bluetooth hardware connected to your computer. It can be built-in or external (USB, Serial) Bluetooth adapter that works with BlueSoleil or Microsoft Bluetooth drivers (Bluetooth Framework does not support Bluetooth LE communication with Toshiba Bluetooth drivers). To get the active Bluetooth Radio object an application should use the wclBluetoothManager class. First it must be opened by calling the Open method. It is good idea to place the code into your main window (form) initialization. Once the wclBluetoothManager opened you can try to find the working Bluetooth Radio object. Note: Bluetooth Framework always detects Microsoft Bluetooth Radio even there is other drivers installed. Your application must not destroy the Bluetooth Radio Object returned by the wclBluetoothManager class. To find more detailed information and code example about working with the wclBluetoothManager and how to get the working Bluetooth Radio Object refer to the GattDemo application from the Bluetooth Framework package. Once you get the working Bluetooth Radio Object you need to discover nearby Bluetooth LE devices. Depending on the used Bluetooth drivers in-app discovering can be different. On Windows 8 you must discovr and pair with Bluetooth LE device through Windows UI. After device paired you can discover it using in-app discovering methods. On Windows 10 12040 and below you also have to pair with Bluetooth LE device through Windows UI. After device paired you can discover it using in-app discovering methods. On Windows 10 14393 and above you do not need to pair with your device manually. You can discover nearby Bluetooth LE device using in-app discovering. To discover nearby Bluetooth LE device call the Discover method of the wclBluetoothRadio object. Item.SubItems.Add(''); // We can not read a device's name here. Item.Data := Radio; // To use it later. // Here we can update found devices names. Item->SubItems->Add(""); // We can not read a device's name here. Item->Data = (void*)Radio; // To use it later. Item.SubItems.Add(""); // We can not read a device's name here. Item.Tag = Radio; // To use it later. Item.SubItems.Add("") ' We can not read a device's name here. Item.Tag = Radio 'To use it later.
' Here we can update found devices names. Dim DevName As String = ""
lvDevices.SetItemText(Item, 1, _T("")); // We can not read a device's name here. lvDevices.SetItemData(Item, (DWORD_PTR)Radio); // To use it later. If you need to know the Bluetooth LE device name or other information you should read it only after discovering completed. The OnDiscoveringCompleted event handler is good place to do that (as it is shown in code above). To find more detailed information and code example about discovering nearby Bluetooth LE devices refer to the GattDemo application for the Bluetooth Framework package. After discovering Bluetooth Low Energy devices you can connect to it. To connect to a remote Bluetooth LE device you need to know its Address (which is discovered on the previous step) and the working Bluetooth Radio Object. Note: Connection procedure is asynchronouse. The call to the Connect method of the wclGattClient class simple starts the connection procedure. After connection is established (with or without success) the OnConnect event fires with the real connection result code. In case case if connection was established with success (the Error parameter passed into the OnConnect event handler is WCL_E_SUCCESS) the wclGattClient stays in csConnected state and you can read device's GATT services, characteristics and other attributes. If the connection was not success the wclGattClient switches back to the csDisconnected state and your application can try to connect to it once again or try to connect to other BLE device. To disconnect from the connected BLE device call the Disconnect method of the wclGattClient class. After disconnecting the OnDisconnect event fires. The event also fires if the device terminates the connection from its side. // Connection property is valid here.
' Connection property is valid here. To find more detailed information and code example about connecting to the selected Bluetooth LE devices refer to the GattDemo application from the Bluetooth Framework package. Once connection to the Bluetooth Low Energy device has been established you can read the devices services. The GATT services are collections of characteristics and relationships to other services that encapsulate the behavior of part of a device. Each service has UUID that unique identifies the services. Bluetooth SIG defines the List Of the Service Assigned Numbers. To read GATT services Bluetooth Framework provides ReadServices method of the wclGattClient class. Note: services reading is synchronouse procedure. To find more detailed information and code example about reading Bluetooth LE GATT services refer to the GattDemo application from the Bluetooth Framework package. Once you read services you can read Characteristics of the selected service. The Characteristic encapsulates a single data point (though it may contain an array of related data, such as X/Y/Z values from a 3-axis accelerometer, etc.). Each Characteristic described via a pre-defined 16-bit or 128-bit UUID. Here you can find the standard characteristics defined by the Bluetooth SIG. Characteristics are the main point that you will interact with your BLE peripheral, so it iss important to understand the concept. They are also used to send data back to the BLE peripheral, since you are also able to write to characteristic. IsBroadcastable - True indicates that the Characteristic can be broadcast. IsReadable - True indicates that the Characteristic can be read. IsWritable - True indicates that the Characteristic can be written to. IsWritableWithoutResponse - True indicates that the Characteristic can be written to without requiring a response. IsSignedWritable - True indicates that the Characteristic can be signed writable. IsNotifiable - True indicates that the Characteristic can be updated by the device through Handle Value Notifications, and the new value will be returned through the event. IsIndicatable - True indicates that the Characteristic can be updated by the device through Handle Value Indications, and the new value will be returned through the event. HasExtendedProperties - True indicates that the Characteristic has extended properties, which will be presented through a Characteristic Extended Properties descriptor. To find more detailed information and code example about reading Bluetooth LE GATT characteristics refer to the GattDemo application from the Bluetooth Framework package. If the Characteristic has the IsReadable property set to True an application can read the Characteristic's value. Bluetooth Framework represents the Characteristic value as a raw bytes array. The meaning of the value depends on the characteristic's UUID. Bluetooth SIG defines the meaning for the Characteristics Assigned Numbers. The meaning of the value of the vendor defined characteristics can be different and defined by the vendor. If the Characteristic has either IsWritable or IsWritableWithoutResponse or IsSignedWritable property set to True an application can Write to the Characteristic. To find more detailed information and code example about reading and writing Bluetooth LE GATT characteristics refer to the GattDemo application from the Bluetooth Framework package. In addition to the Properties the Characteristic may have Descriptors that are defined attributes that describe a characteristic value. The Descriptor is described by the UUID. Bluetooth SIG defines Descriptors Assigned Numbers for predefined descriptors. The vendors can use custom UUID for the vendor specified Descriptors. To find more detailed information and code example about reading Bluetooth LE GATT descriptors refer to the GattDemo application from the Bluetooth Framework package. If the Characteristic has either IsNotifiable or IsIndicatable property set to True the Characteristic can send notifications to the application when the Characteristic's value changed. Bluetooth Framework supports both notification types. To subscribe for the Characteristic's changes the application must call the Subscribe method first (that should be done for each Characteristic the application is interested in). After that to start receiving notification an application must write the Client Configuration Descriptor for the selected characteristic. To make it simple Bluetooth Framework includes the WriteClientConfiguration method that does all the things to write the descriptor. Once the notification has been received the OnCharacteristicChanged even fires. The new value of the Characteristic is passed to the event handler as a Raw Bytes Array. The application can detect which Characteristic has been changed (if it is supscribed to more than single Characteristic) by Characteristic's Handle that is also passed to the event handler. To find more detailed information and code example about subscribing to the Characteristic change notifications refer to the GattDemo application from the Bluetooth Framework package. The Bluetooth Framework package includes the GattClient sample application that shows how to use the wclGattClient class. To download Bluetooth Framework package visit the Bluetooth Framework page.